1. Your DVD or Blu-Ray Drive will be treated as an external drive. Back in Lightroom, these files will continue to be associated with this drive. 2. You want to “ADD” these files to My Catalog. The whole reason to use an archive is to free up space on your system’s hard drive. By selecting to ADD these files, Lightroom will only record the reference to the files and not create a local copy of them. 3. Change the Render Preview to “Standard”. This is crucial! The default setting for Rendered Previews under File Handling is “Minimal”. With that setting, Lightroom does not store a preview version of the photo and will delete the preview as soon as the disk is removed from the drive. By changing this setting to “Standard”, Lightroom 3 will keep a large preview in its local files which can be accessed at any time, even when the archive disk is not accessible. This setting will even allow the preview images to be zoomable! The default setting for the preview images will be in a folder at the same location as the Lightroom 3 LRCAT file. Make sure you have enough space on the drive to grow! The catalog and preview images for my 55,000 photos is 20 GBs. 4. Assign each archive disk a unique identification and add it as a Keyword. What good is building an archive library if you can’t easily find the correct disk? By adding a unique disk ID as a keyword, it will be added to each photo during the import process. 5. Save these settings as a Preset for future use. 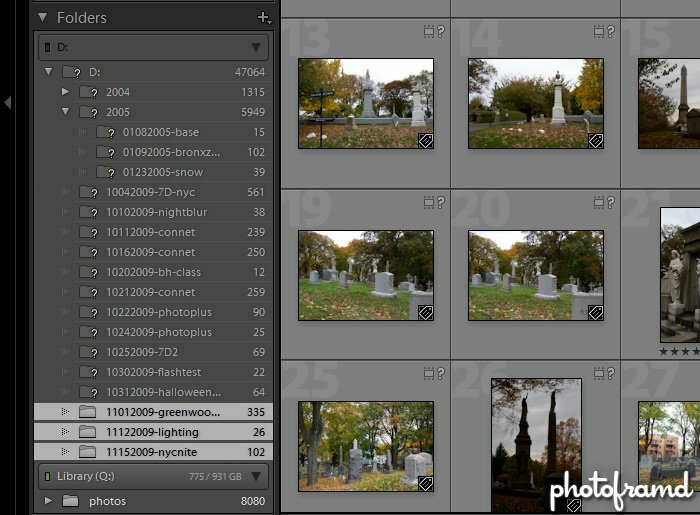 It’s easy to forget these steps, so have Lightroom do it for you by creating a Preset. Just remember to update the unique disk identification as a keyword each time! 6. Click the Import and check on the progress periodically. Lightroom will return to the Library view and slowly add each photo. One annoying issue with the import … if Lightroom encounters a problem reading a file, it will stop and wait for you to clear the alert box. I encounter this a few times with some of my 360-degree panorama files saved a Photoshop PSB (for large and oversized images). Take a look at the above screen capture. All of the Archive DVD and Blu-ray disks are associated with my D: Drive. Because the disk is not in the drive, Lightroom dims the entry and adds a question mark to the folder. However, all of the images can still be previewed and zoomed. Each photo now carries the unique disk identification as a keyword making it easy to locate the archive disk. When that disk is inserted, the folder lights up and you can then resume editing or printing as desired. Notes on creating Archive DVDs and Blu-ray Disks. 2. Bridge CS5 settings import into Lightroom 3. All of my archive disks contained the files which were also used by Bridge CS5. When Bridge makes a setting change, rating or flag to a file, the original file is not altered. Instead, it stores that information in a separate XMP file. I included all of the XMP files on the same data disk as the original photos. As a result, Lightroom 3 imported these Bridge CS5 settings as it imported each photo! 3. Follow a logical folder order. My older files were smaller. One of the benefits of the Canon 20D Raw files. As a result, I created folders by year and then subfolders for each project on the DVDs. When I started backing up my Canon 40D and Canon 7D files, each year spanned multiple disks. I labelled the disks according, but did not include the year folder on the disk. This is an issue for Lightroom. 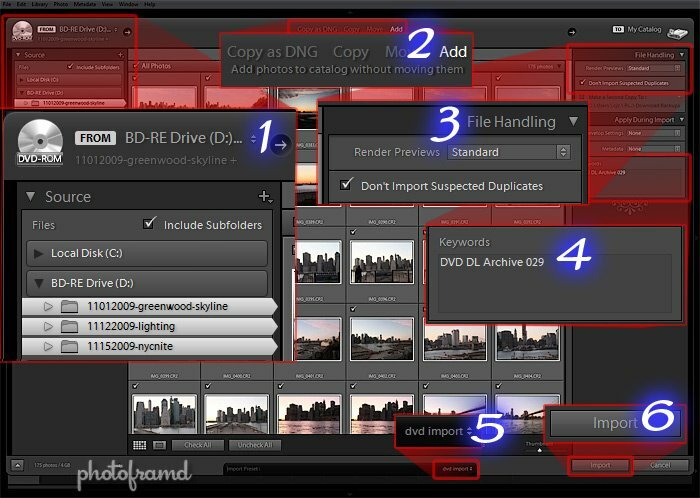 Lightroom 3 will follow your folder structure and combine separate disks. That’s why my 2004 and 2005 files are tucked away neatly in a year folder. Because I did not keep this convention on later disks, Lightroom will not combine them. And, unlike files in your “Library”, the files associated with an external disk (like the DVD/Blu-ray Drive) can NOT be reorganized. ← Previous Previous post: Hell Froze Over – I’m Using Lightroom 3! Do you have a brand/model preference for DVD disks themselves for long lasting archival storage? I always use Verbatim DVDs and BD-R disks. They are very reliable to burn; never a coaster! They carry a “lifetime” warranty which for the DVDs is stated at 100 years. I remember calling Verbatim to ask about the shelf life of the BD-R disks and was told they are also 100 years; however, they do not state that on the website, nor the disks. Again, I have NEVER had a problem with them and rely on them. B&H does have a great price on the 6x BD-R DL blanks in 3-packs and 10-packs.